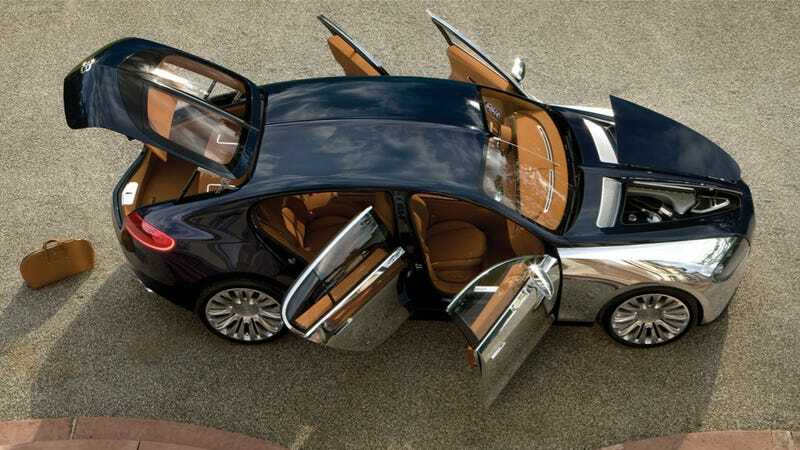 I have sad news this morning for the, I don't know, maybe three people in the world who were willing to pony up more than $1 million for a Bugatti sedan: the 2009 Bugatti Galibier isn't happening. But a new Veyron is, so that should make you feel better. Bugatti Galibier: Four-Door Coupe Gets Name, Details, Photos! Speaking to Top Gear, Bugatti chief Dr. Wolfgang Schreiber said that the W16-powered Galibier that debuted as a concept five years ago now isn't in the cards anymore. It was reportedly set for production at one point. Also dead, according to Schreiber, is the horsepower race involving the current Veyron, apparently. "We will not produce a 'SuperVeyron' or Veyron Plus, definitely," said the Bugatti president, who who was key in the development of the Veyron back in the early Noughties as Bugatti's Technical Director. "There will be no more power. 1200PS is enough for the chapter of Veyron and its derivatives." So does that mean the Veyron is dead? Not at all. Schreiber says they're working on a new one to fit into a new era, which Top Gear implies will fall along the hybrid hypercar lines of the LaFerrari, McLaren P1 and Porsche 918. Whatever form it takes, it has to "redefine the benchmarks," Schreiber said. Schreiber wouldn't come out and confirm hybrid power, but it makes sense to think that's the way it will go. "But it's too early to open the door and show you what we have planned. For now we have to keep the focus on the current Veyron, and help people to understand that this really is the last opportunity to get the car, which will have run for ten years from 2005-2015. Then we will close this chapter and open another one." Hey guys, when you make a new Veyron, feel free to put me in it again. I'll let you know if it's any good or not.